Online (preferred) and paper registration options are available. Senior student VIP table. All other open seating (tables of 8). The 2019 NCHS Band Banquet is not for only seniors. We will recognize all students (9 – 12) throughout all aspects of the 2018-2019 NCHS Band and Spirits Colorguard programs! We would also like to invite parents, siblings and guests to join us for dinner and the celebration. 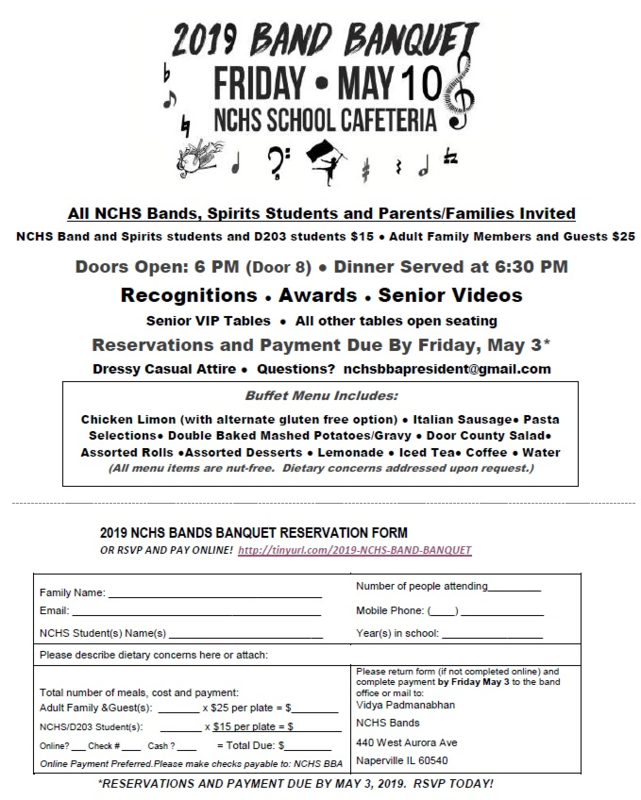 Note: Our 2019 Senior video and recognitions will take place at the banquet rather than at the May band concert. Reservations and payments are due on or before FRIDAY MAY 3rd. No reservations or payments can be accepted at the door. A quick bit of history: Before our school renovation project we annually held a “Band Awards Banquet” that honored our freshman through seniors. This encompassed all of our curricular and extracurricular ensembles freshman through seniors. It was an outstanding way to celebrate our student’s achievements of the year.